LONDON - A poignant photo of a Muslim man kneeling down to comfort a crying elderly Jewish woman at a vigil for the victims of the Manchester attack has touched social media users. 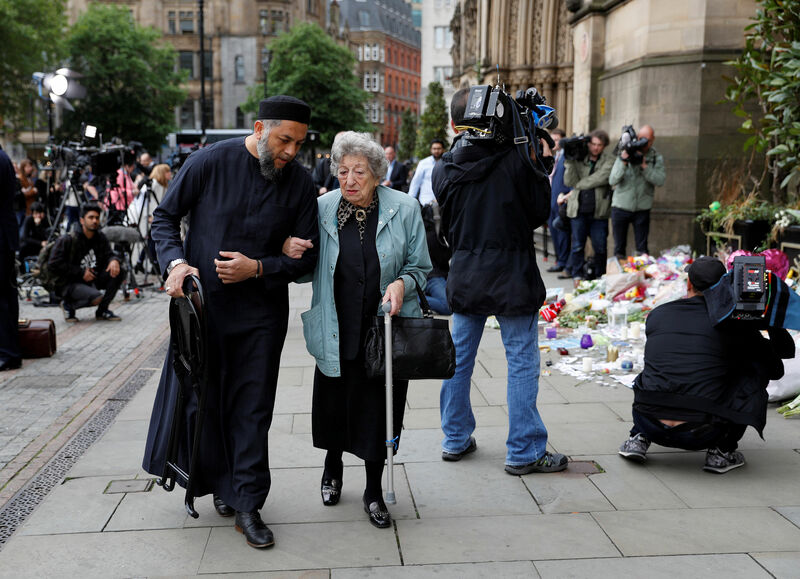 The photo captures Sadiq Patel, clad in a long blue robe and a black Muslim cap, consoling Renee Rachel Black as she sat and wept among the floral tributes in Manchester's Albert Square, where a vigil was held on Tuesday for the victims of Monday night's attack. The heartwarming photo has since been hailed as a symbol of the city's unity following the attack at an Ariana Grande concert which killed 22 people, many of them children. Dozens more were injured in the suicide bombing at the city's 21,000-capacity Manchester Arena. Another photo shows the pair praying together: Black with her head bowed down and Patel with his head buried in his hands. Patel is also seen in another photo helping Black, who walks with a cane, back on her feet before they walked off together, arm in arm. His other hand is seen carrying Black's chair. The pair's interaction sparked emotional reactions on social media. Twitter user @taseulima said: "Images like these just melt my heart", as she shared a link to an article by Britain's Independent news website about the touching moment. Another user, @QudsiyaMashhadi, called it "inspiring". Other acts of kindness have also been reported in the wake of the attacks, with social media quickly galvanised to help those affected. Residents and businesses in Manchester on Tuesday used the hashtag #RoomforManchester on Facebook and Twitter to offer food, shelter, warmth and transport to those stranded in the city. The BBC also reported that taxi drivers also stepped in, turning off their meters to help ferry the stranded concert-goers around the city for free.